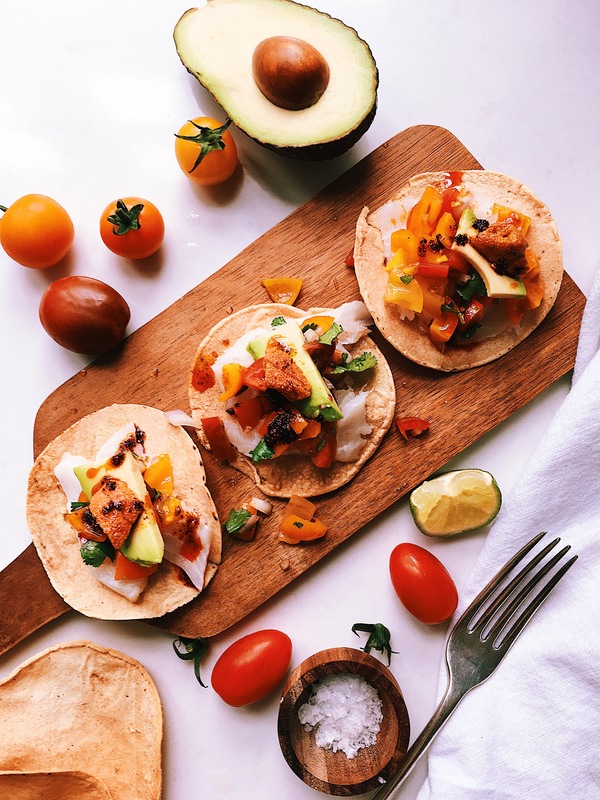 We had such a sunny day in London that I felt I was in Ensenada and I fancied doing some ceviche, so here is the super mega quick recipe for these lovely fish and sea urchin ceviche tostadas. Heat the oven to 180 degrees and place the tortillas on a baking tray. Toast them for 10 min or until golden brown. Take them out of the oven and set aside. Chop all the vegetables finely and put the on a bowl, except the avocado. Add salt to taste and squeeze a lime. Set aside. Cut the avocado in slices and set aside. Cut the cod fillets in thin slices and set aside. Wash the sea urchins and using scissors cut the top. Open them and remove the orange bits (roe) those are the bits that we eat. Set aside. To make the tostadas: put some avocado slices, then fish then some of the veggies. Top the tostada with some sea urchin and add some spicy salsa. Enjoy!